I’ve got a couple of new plants blooming in the garden this year for the first time. 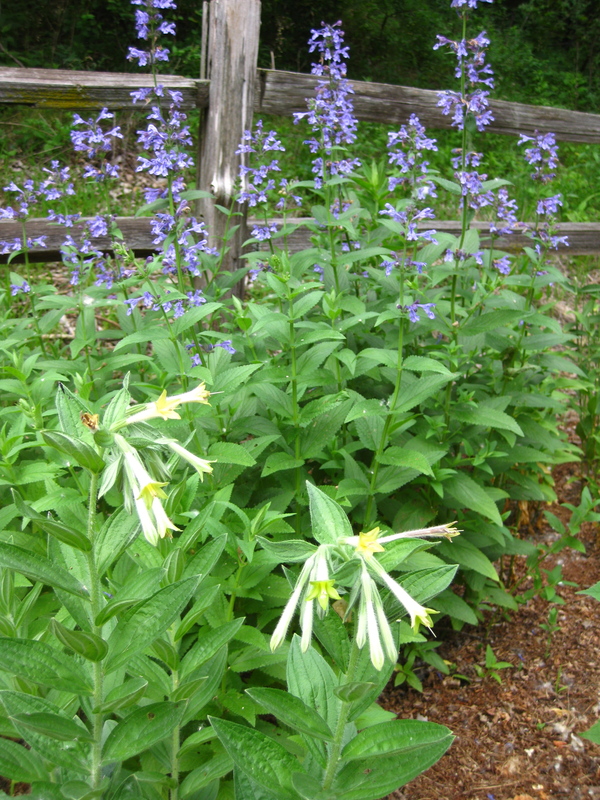 Both are growing and blooming well in the garden here, though neither originates from a location anywhere near the Upper Midwest. Siberian Catmint (Nepeta sibirica) originates from Siberia south to Mongolia and Northern China. The popular cultivar ‘Souvenir d’André Chaudron’ is the plant above with the beautiful lavender-blue flowers. It violates one of my cardinal rules of hummingbird gardening, which is to choose only plants that are derived from species that are hummingbird-pollinated (or at least bird-pollinated) in the wild. The rule was to ensure that all the plants in my garden produced copious nectar. As a general rule, plants with flowers that are pollinated by birds produce more nectar and provide more total sugar to their visitors than plants pollinated by bees, hawkmoths, or butterflies. Rules are made to be broken, however, and after wrestling with the issue for some time, I decided to make an exception for this plant. I made the exception for a number of reasons. First, I was smitten with the plant when I saw it growing here in Red Wing in the garden of Terry Yockey, chief Master Gardener hereabouts and a garden writer with her own website. She and others have touted Siberian catmint as attractive to hummingbirds. I was won over by the beautiful flower color–I’m always looking for colors to provide some cool visual relief from the hot reds that predominate in my garden and are typical of hummingbird-pollinated flowers. My research showed it to be easy to grow and overwinter here in zone 4, and I considered it a bonus that it readily spreads without becoming invasive. Terry kindly provided me with a few starts from her garden last year. Initially, the plants languished because they were planted out late in the heat of mid-summer and had to complete with some well-established neighbors. They survived the summer, and breezed through our mild (for us) winter. I was amazed by how much the spread in just one year. They came up early and have grown into erect, full, multi-stemmed plants, and are blooming very nicely here in early summer. I haven’t seen much hummer use yet, only two visits over the past week, but my hummers at this point in the year tend to be feeder junkies before my garden has reached full bloom. Though I haven’t seen much hummer use yet, I have noticed a lot of interest from hummingbird moths. I’ve seen moth visits on the catmint every day since they have started blooming, sometimes two moths at the same time visiting the patch. I haven’t seen the moths visit anything other than the catmint this year. I’ll continue to monitor the activity as the summer progresses–I hope the catmint will continue to bloom long into the summer, and it will be regularly visited by hummingbirds, because it seems to be an easy plant to grow here, and it is beautiful. Giant trumpets (Macromeria viridiflora) is not from quite so far away–it is native to the mountains in New Mexico and Arizona south into Mexico. Although you might find it surprising that a hummingbird plant native to the Southwestern U.S. would be hardy here in Minnesota, there are quite a few that can survive our cold winters–coral bells (Heuchera sanguinea), scarlet hedge nettle (Stachys coccinea), and a number of different penstemons, to name a few. I was able to obtain some seed a couple of years ago to try. The seeds are unusual–shiny and white, which gives rise to another common name for the species–pearlseed. I wintersowed the seed, and successfully germinated a few which I grew on and planted out at the end of the summer last year. The plants all survived the relatively mild winter without any special protection. I’m surprised that they are blooming already–I wasn’t expecting bloom until mid-summer. I am very pleased with the plants so far–they have upright stiff stems and wonderfully textured leaves. The flowers, though not very colorful, are bright and stand out at the top of the stems. Although the flowers aren’t the typical red of hummingbird-pollinated plants, field research has shown it to be pollinated in the wild primarily by hummingbirds. Interestingly, the flowers in the southern part of the plant’s range, where larger, longer-billed hummer species visit, have longer flowers than in the northern part of the plant’s range. I haven’t witnessed any hummer visits yet, but I only have one plant in bloom so far. I’ll keep watching with my fingers crossed! I hope your catmint is a success. My hummingbirds seem to like it a lot. (Same variety) I planted it after watching a Wisconsin garden program on hummingbird gardens. I also planted some Petunia exserta after reading your post. Your picture shows a lot more flowers than my plants have though. grikdog: I watched the catmint for a bit this evening, but only saw the moths visiting again. Not disappointed yet, though–the moths are fun to watch, and I suspect the Nepeta patch might be within the territory of a male super-hummer that is defending all feeders but one, and a portion of the flower bed, too. The one undefended feeder gets drained daily by all the hummers relegated to it. If the super-hummer is defending the Nepeta, too, I’m sure no hummer dare go near it. As for the Petunia exserta, hang in there–the blooms start off modestly, but before long the plant branches out and blooms like crazy. One of my Petunia beds is full of blooms now, but so far I’ve not seen much hummer use–hopefully that will change. Good to hear it (P. exserta) will fill out. Since you seem to push your zones, have you ever tried any of the Zauschneria ? I planted a Zauschneria garrettii that the hummers liked last year expecting it to be a one off but it came back this year and even spread a little. grikdog: Yes, I’ve had it growing in my sand bed for the past 4 or 5 years. It always comes back for me, and yes, it does spread! The problem I’ve had is that there is some pest I have in my yard that gradually reduces the leaves to skeletons every year, so I never get a good display of blooms at the end of the season. It always starts out looking so healthy and vigorous in the spring that I let it be to see if this is the year it will avoid the pest problem. Same thing happens every year to Heuchera sanguinea in my garden, but only to those two plants. I’m glad yours came back–it is a very impressive late season bloomer when grown well. So glad to have found your blog! I also garden for hummingbirds (although most of my blog lately has been about travel). 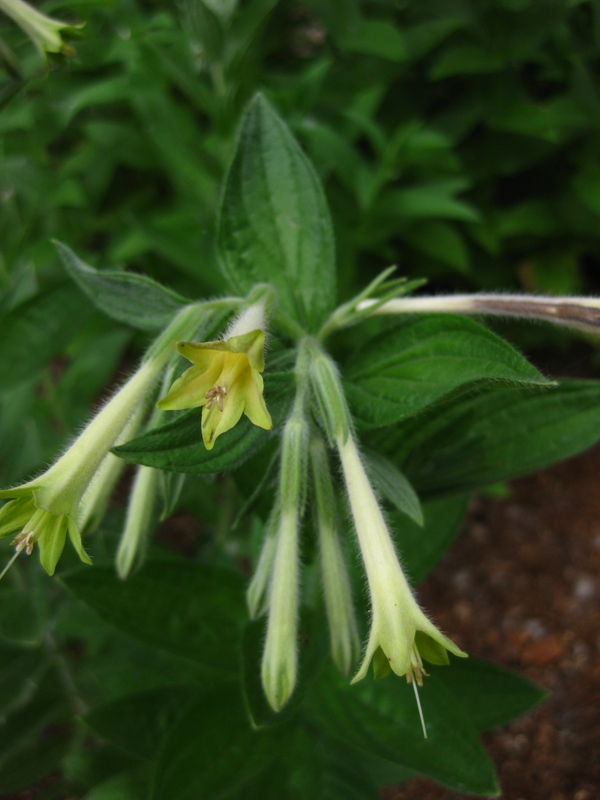 I can learn quite a bit from you as you have even harsher winters than I to contend with and you seem to try to only use plants that ‘might’ handle your environment, whereas I have been using many tropical annuals (salvia and cuphea most notably). I am really looking forward to learning more. Thanks! Colmel: Thanks for visiting the blog! I’ve been gardening for hummingbirds for quite a few years now, but I feel like I’m still on the very steep portion of the learning curve–that is what for me makes this endeavor so addicting. The majority of my garden is devoted to hummingbird attracting plants that will not survive winter here in zone 4, but I’m trying every year to raise the percentage of my garden devoted to perennials, while also experimenting with new ways to overwinter tender plants.